It’s Day 2 of our 12 Days of Christmas Ideas Series! We are sharing 12 Unique DIY Christmas Wreath ideas anyone can do! Erlene of My Pinterventures and I teamed up to bring you 12 Days of Christmas Ideas! We will be sharing; party ideas, recipes, DIY decor and ornaments, gift wrapping and so much more for the next 12 days! Every day through December 12th, we will be sharing a different theme with lots of great ideas to make your holiday season great! Let’s begin with a couple of DIY Christmas Wreaths Erlene and I have made! All 12 Days are linked here for you to easily find tons of ideas to make your Christmas special! wow these are fun and unique wreaths! I like the horse and the snowmen and the denim! but the horse the best! Thanks for sharing at the Christmas in July party! 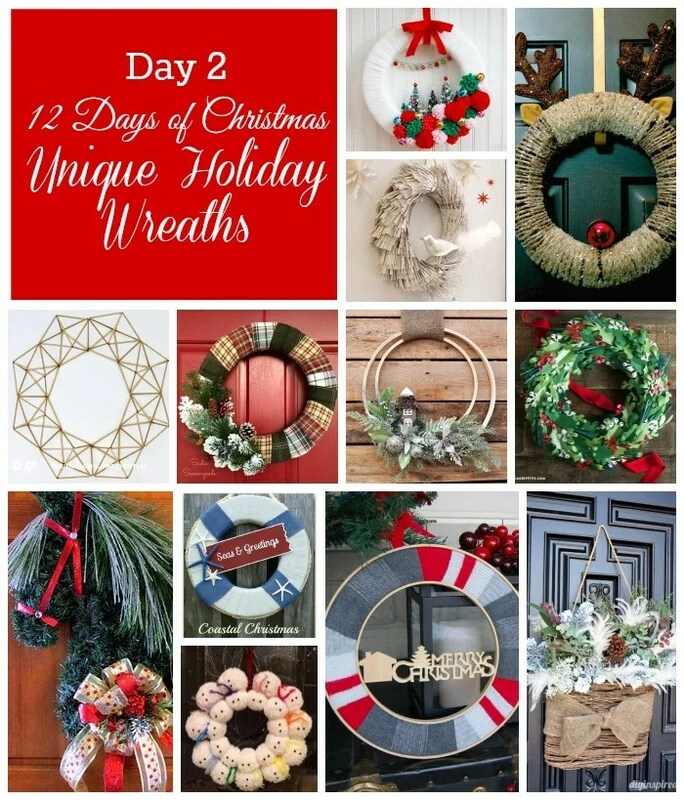 I love a holiday wreath and these are some great ideas! Being in Annapolis I especially love the idea of a nautical themed wreath! Such cute ideas. My son wrote a Christmas letter to my parents and told them I need a wreath for my door, that mine is to large. It was a cute letter and this post is apparently perfect timing! Those are beautiful wreaths! I would love to have one of them hanging on my front door. Maybe I will make time to make a new one this year. These wreaths are all so pretty. I need to try and make my own. These are beautiful wreaths! I think they would make a wonderful gift as well. I think I can make my own wreaths but after I make them I am disappointed. These are some really creative ones. So many beautiful wreaths! I’ve been so busy that I haven’t replaced my fall wreath with my Christmas wreath. I have my Christmas decor done on the inside, but the outside remains unadorned. 🙁 Plus, both of our bathrooms are being remodeled. Fingers crossed that they will be done before Christmas.